Welcome to Wyandotte Daily! – Page 4897 – Serving Kansas City (Wyandotte County) Kansas for over 45 years! The Board of Public Utilities will meet on Wednesday, Nov. 5, at the BPU offices, 540 Minnesota Ave., Kansas City, Kan. The work session will begin at 5 p.m.
On the agenda for the work agenda are a general manager update, a board update, and a revenue forecast. The BPU regular meeting begins at 6 p.m. Nov. 5. On the agenda for the regular meeting are a visitors’ time, a report about the Rosedale Development Association, the Integrated Resource Plan, a third quarter financial report, board comments, manager comments and a closed executive session. Both meetings are open to the public, except for the closed executive session portion of the meeting. Candidates in the midterm elections are hoping for a win this week, and so are Kansas Lottery players. More than half a billion dollars in jackpots are up for grabs this week. The Mega Millions jackpot for Tuesday night is $321 million, with a cash option of $194.1 million. That’s the largest Mega Millions jackpot since March 2014, and the 8th largest Mega Millions jackpot in history. The largest lottery jackpot ever won was a $656 million Mega Millions jackpot on March 30, 2012, which was split by winners in three states, including a winner from Franklin County in Kansas. In addition to the Mega Millions rolling jackpot, Powerball continues to roll. Any ticket that matches all numbers in Powerball Wednesday will win or share a jackpot estimated at $178 million, with a cash option of $111.1 million. The Hot Lotto jackpot is estimated at $1.8 million for Wednesday. 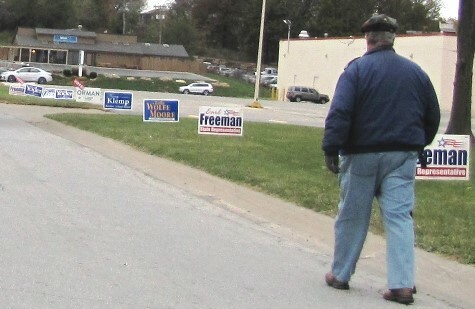 A man walked along North 79th Street, north of State Avenue in Kansas City, Kan.,, on Election Day, where campaign signs lined the street leading to a polling place. Voter turnout seemed good at some polling places in Wyandotte County, but there was still a long way to go to catch up to predictions. Wyandotte County Election Commissioner Bruce Newby said that as of about 1:30 p.m. today, Wyandotte County voter turnout is about 18 percent, with about 14,000 votes cast. Average turnout for the fall general election in a midterm year has been about 40 percent, so there is still a way to go, Newby said. There were about 3,734 advance ballots cast so far, and voters who already received an advance ballot in the mail can still bring them in before 7 p.m. tonight to the Election Office at 850 State Ave. so they can be counted. Newby said there is still hope that the turnout will pick up later today. Polls are open until 7 p.m. tonight. A good voter turnout was reported about mid-morning in Wyandotte County by election workers at two polling places. One polling place near downtown Kansas City, Kan., reported a good turnout. In the Argentine area, turnout also was considered good. “It’s very steady,” said Jesse Rocha, election judge at the Argentine Community Center. Some of the polling places in Wyandotte County had lines this morning, according to workers at the polls. Turnout was considered good about 1 p.m. at a polling place on North 79th Street, north of State Avenue, where more than 200 votes had already been cast. To find your polling place, call the Election Office at 913-573-8500 or visit http://wycokck.org/election/ or https://myvoteinfo.voteks.org/.